Have you ever become wrapped up in a whirlwind romance, only to later discover that your partner was not who you thought they were? Did you cast your partner in your image of a perfect lover, rather than discovering their true nature? Did you look to them for a sense of purpose, identity, and self-worth? We often feel that we are in love, when really we are in need of validation. 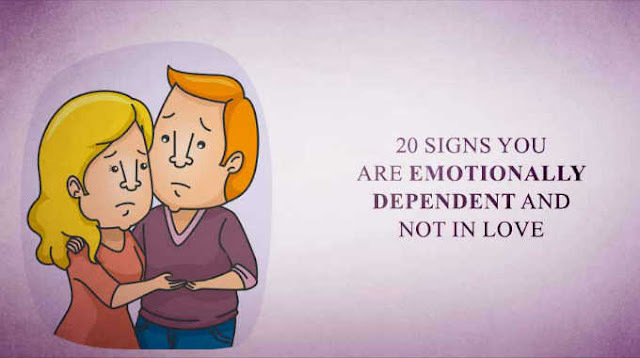 Below are twenty signs that your relationship may have more to do with emotional dependence than true love. If your partnership seems to fall into the pattern outlined here, you may want to think twice about whether it is a healthy one for you. 01. You are often jealous when your partner spends time with other people. 02. Your partnership is causing you or your significant other to withdraw from relationships and hobbies that used to be important. 03. You find yourself feeling possessive of your partner. You don’t trust other women/men around him/her. You are afraid your partner will get stolen away from you. 04. You have changed your favorite sports teams, spiritual practices, or political affiliation to please your partner. 05. When your partner is not with you, you feel empty, alone, or bored. 06. You need constant reminders that your partner loves you. 07. You will cancel plans with family or friends to spend time with your partner. 08. You fish for compliments. 09. You like to have some degree of control over your partner. If they don’t do what you want them to, you feel distraught. 20. You tend to idealize people, and then fall apart when they do not live up to your image of them. Love is not the same as neediness. Two people who are truly in love are able to trust, respect, and accept one another. These things are rarely present in an emotionally dependent partnership. True love involves knowing and loving oneself, and then giving the same to another person. This is how two human beings are able to build a happy life together. If you have fallen into a pattern of emotionally dependent relationships, you may want to take some time alone to find yourself. This sounds scary. Most important things are. However, if you can do it, you may find that learning to know and love yourself is the most powerful thing you ever choose to do.